By Catherine Rosemary Rider in Uncategorized on 20th Feb, 2019 . 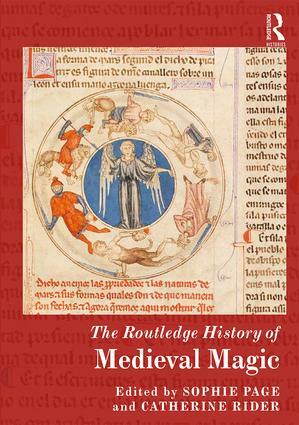 I’m very pleased to announce that the Routledge History of Medieval Magic, edited by Sophie Page (UCL) and me, has been published. As editors we’re very happy with it and we hope others will be too. Seeing it in print has prompted me to reflect back on the process of editing such a large volume over several years. We started the planning back in 2013, when the publishers Ashgate approached Sophie about editing a volume on magic for their Research Companions series. (As some of you may know Ashgate was later taken over by Routledge, so it’s now a Routledge Histories volume.) Sophie asked me if I was interested in sharing the editing and, thinking that this would be an interesting way to get up to speed on the field, I said yes. Planning the volume, we were clear that we didn’t want to produce a survey of the history of medieval magic. We knew of several other history of magic surveys which had substantial medieval sections and were either recently published or in the pipeline. Instead we wanted to produce a guide to researching in the field. 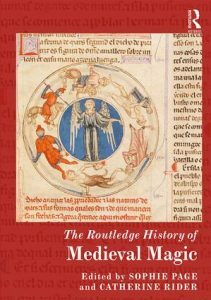 The study of medieval magic has grown very rapidly since the 1990s and we felt there was a need for a volume that outlined the new developments and highlighted possible future directions that research could take. We also wanted some methodological reflections: how can (or should) medievalists define magic? Sophie’s idea here was to get several short pieces from scholars with very different approaches, and ask them to comment on one another. Together we drew up a rather long wish-list of possible contributors. Here it was good to have a co-editor since we were able to pool our expertise and lists of contacts. Sophie works on magical texts and knew exactly who was doing interesting work in this area, while I had a better knowledge of scholarship on the Church, condemnations of magic, and the rise of witchcraft stereotypes. We also thought about our own contributions: I remember sitting in the British Library café with Sophie saying ‘We should have a chapter on gender and it should cover this, and this, and this…’ so that became mine. Once the publisher had accepted our proposal we wrote to our entire wish-list. Gratifyingly, many of them said yes – more, in fact, than I had expected. This made it a very large volume, with a total of 35 chapters, and that brought some logistical challenges. Our authors worked very hard and were exceedingly patient, but it took considerable time to liaise with that many people, comment on drafts, sort out images, etc, and we needed to be a bit flexible about deadlines, since the contributors were also busy with many other projects. All this meant that the volume took rather longer than planned, especially when we had to factor in my and Sophie’s other commitments to funded projects, other publications, and a period of maternity leave. Routledge were very patient, and so too were the authors who submitted chapters early on in the project – and we are very grateful for that. My advice to anyone considering a large editing project like this would be not to underestimate the time involved, or the need for a long (and, to a degree, flexible) timescale! Nonetheless I am very glad we did it. We have managed to be very comprehensive in terms of the people working in the field, ranging from recent PhDs to senior scholars, and taking in contributors from the UK, continental Europe, and North America. I am also pleased about the range of angles we have managed to cover – thinking about concepts and definitions of magic, magical texts, authors, themes, and condemnations of magic. The book has certainly inspired me to think about where I want to go next!